Take in Northwest views of beautiful tree lined streets of the West End and North Shore mountains from this gorgeous corner suite in "Patina" by Concert Properties, a luxury 42 storey tower in the heart of Downtown Vancouver. 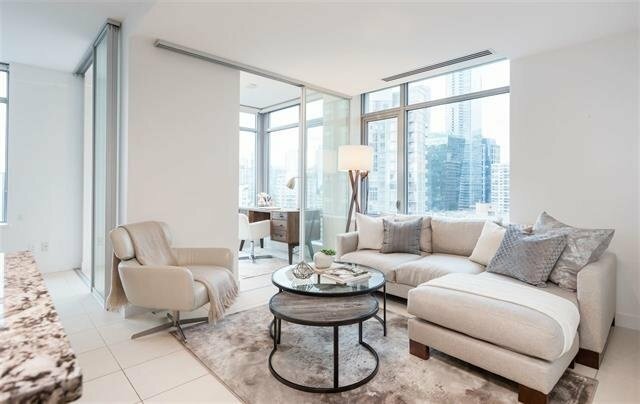 2 bed, 2 bath + DEN provides the utmost convenience for a downtown lifestyle. Features include air conditioning, Italian ceramic tiles, soft close cabinets and granite countertops, Liebherr & Miele appliances and large bathrooms with soaker tubs. Patina offers 5 star amenities including 24-hr concierge, on-site caretaker, extensive gym & lounge, party room and roof garden. 1 parking, large in-suite storage room, bike room and guest parking. Pets & rentals are welcome.